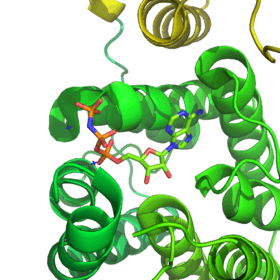 In biochemistry, a kinase is an enzyme that catalyzes the transfer of phosphate groups from high-energy, phosphate-donating molecules to specific substrates. This process is known as phosphorylation, where the substrate gains a phosphate group and the high-energy ATP molecule donates a phosphate group. This transesterification produces a phosphorylated substrate and ADP. Conversely, it is referred to as dephosphorylation when the phosphorylated substrate donates a phosphate group and ADP gains a phosphate group (producing a dephosphorylated substrate and the high energy molecule of ATP). These two processes, phosphorylation and dephosphorylation, occur four times during glycolysis. Kinases are part of the larger family of phosphotransferases. Kinases are not to be confused with phosphorylases, which catalyze the addition of inorganic phosphate groups to an acceptor, nor with phosphatases, which remove phosphate groups. The phosphorylation state of a molecule, whether it be a protein, lipid, or carbohydrate, can affect its activity, reactivity, and its ability to bind other molecules. Therefore, kinases are critical in metabolism, cell signalling, protein regulation, cellular transport, secretory processes, and many other cellular pathways. The kinase enzymes increase the rate of the reactions by making the inositol hydroxyl group more nucleophilic, often using the side chain of an amino acid residue to act as a general base and deprotonate the hydroxyl, as seen in the mechanism below. Here, a reaction between adenosine triphosphate (ATP) and phosphatidylinositol is coordinated. The end result is a phosphatidylinositol-3-phosphate as well as adenosine diphosphate (ADP). The enzymes can also help to properly orient the ATP molecule, as well as the inositol group, to make the reaction proceed faster. Metal ions are often coordinated for this purpose. Mechansim of phosphatidylinositol-3 kinase. ATP and phosphatidylinositol react to form phosphatidylinositol-3-phosphate and ADP, with the help of general base B. After creation of the dTMP molecule, another kinase, thymidylate kinase, can act upon dTMP to create the diphosphate form, dTDP. Nucleoside diphosphate kinase catalyzes production of thymidine triphosphate, dTTP, which is used in DNA synthesis. Because of this, thymidine kinase activity is closely correlated with the cell cycle and used as a tumor marker in clinical chemistry. Therefore, it can sometime be used to predict patient prognosis. Patients with mutations in the thymidine kinase gene may have a certain type of mitochondrial DNA depletion syndrome, a disease that leads to death in early childhood. Wikimedia Commons has media related to Kinases. ↑ Siebold, C; Arnold, I; Garcia-Alles, LF; Baumann, U; Erni, B (Nov 28, 2003). "Crystal structure of the Citrobacter freundii dihydroxyacetone kinase reveals an eight-stranded alpha-helical barrel ATP-binding domain.". The Journal of Biological Chemistry. 278 (48): 48236–44. doi:10.1074/jbc.M305942200. PMID 12966101. 1 2 Manning G, Whyte DB, et al. (2002). "The protein kinase complement of the human genome". Science. 298 (5600): 1912–1934. doi:10.1126/science.1075762. PMID 12471243. ↑ "History of ATP research milestones from an ATP-related chemistry". Nobelprize.org. ↑ Samarasinghe, Buddhini. "Hallmarks of Cancer 1". Scientific American. ↑ Bleeker, FE; Lamba, S; Zanon, C; Molenaar, RJ; Hulsebos, TJ; Troost, D; van Tilborg, AA; Vandertop, WP; Leenstra, S; van Noorden, CJ; Bardelli, A (26 September 2014). "Mutational profiling of kinases in glioblastoma.". BMC Cancer. 14: 718. doi:10.1186/1471-2407-14-718. PMID 25256166. ↑ Lahiry, Piya; Torkamani, Ali; Schork, Nicholas J.; Hegele, Robert A. (January 2010). "Kinase mutations in human disease: interpreting genotype–phenotype relationships". Nature Reviews Genetics. 11 (1): 60–74. doi:10.1038/nrg2707. ↑ Krebs, EG (Jul 5, 1983). "Historical perspectives on protein phosphorylation and a classification system for protein kinases.". Philosophical transactions of the Royal Society of London. Series B, Biological sciences. 302 (1108): 3–11. doi:10.1098/rstb.1983.0033. PMID 6137005. ↑ Corbellino, M; Poirel, L; Aubin, JT; Paulli, M; Magrini, U; Bestetti, G; Galli, M; Parravicini, C (Jun 1996). "The role of human herpesvirus 8 and Epstein-Barr virus in the pathogenesis of giant lymph node hyperplasia (Castleman's disease).". Clinical Infectious Diseases. 22 (6): 1120–1. doi:10.1093/clinids/22.6.1120. PMID 8783733. ↑ Scheeff, Eric D.; Bourne, Philip E. (2005). "Structural Evolution of the Protein Kinase–Like Superfamily". PLoS Computational Biology. 1 (5): e49. doi:10.1371/journal.pcbi.0010049. PMC 1261164 . PMID 16244704. 1 2 Krebs, EG; Tan, ST; Carrow, DJ; Watts, MK (Oct 1985). "The phosphorylation of proteins: a major mechanism for biological regulation. Fourteenth Sir Frederick Gowland Hopkins memorial lecture.". Biochemical Society Transactions. 13 (5): 813–20. doi:10.1042/bst0130813. PMID 2998902. ↑ Manning, G; Whyte, DB; Martinez, R; Hunter, T; Sudarsanam, S (Dec 6, 2002). "The protein kinase complement of the human genome.". Science. 298 (5600): 1912–34. doi:10.1126/science.1075762. PMID 12471243. ↑ Harper, J. W.; Adams, P. D. (August 2001). "Cyclin-Dependent Kinases". Chemical Reviews. 101 (8): 2511–2526. doi:10.1021/cr0001030. ↑ Karp, Gerald (2010). Cell and molecular biology : concepts and experiments (6th ed.). Hoboken, NJ: John Wiley. ISBN 9780470483374. ↑ Lim, S.; Kaldis, P. (16 July 2013). "Cdks, cyclins and CKIs: roles beyond cell cycle regulation". Development. 140 (15): 3079–3093. doi:10.1242/dev.091744. PMID 23861057. 1 2 Canavese, Miriam; Santo, Loredana; Raje, Noopur (1 May 2012). "Cyclin dependent kinases in cancer: Potential for therapeutic intervention". Cancer Biology & Therapy. 13 (7): 451–457. doi:10.4161/cbt.19589. 1 2 Garrington, TP; Johnson, GL (Apr 1999). 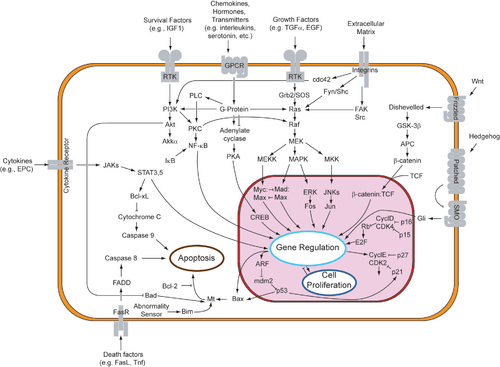 "Organization and regulation of mitogen-activated protein kinase signaling pathways.". Current opinion in cell biology. 11 (2): 211–8. doi:10.1016/s0955-0674(99)80028-3. PMID 10209154. ↑ Sun, Yue; Thapa, Narendra; Hedman, Andrew C.; Anderson, Richard A. (June 2013). "Phosphatidylinositol 4,5-bisphosphate: Targeted production and signaling". BioEssays. 35 (6): 513–522. doi:10.1002/bies.201200171. ↑ Heath, CM; et al. (2003). "Lipid Kinases Play Crucial and Multiple Roles in Membrane Trafficking and Signalling" (PDF). Histology and Histopathology. 18: 989–998. ↑ Cantley, Lewis C (2012). 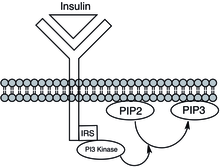 "PI 3-kinase and disease". BMC Proceedings. 6 (Suppl 3): O2. doi:10.1186/1753-6561-6-S3-O2. 1 2 3 Miller, S.; Tavshanjian, B.; Oleksy, A.; Perisic, O.; Houseman, B. T.; Shokat, K. M.; Williams, R. L. (25 March 2010). "Shaping Development of Autophagy Inhibitors with the Structure of the Lipid Kinase Vps34". Science. 327 (5973): 1638–1642. doi:10.1126/science.1184429. ↑ Neubauer, Heidi A.; Pitson, Stuart M. (November 2013). "Roles, regulation and inhibitors of sphingosine kinase 2". FEBS Journal. 280 (21): 5317–5336. doi:10.1111/febs.12314. ↑ Holzer, H; Duntze, W (1971). "Metabolic regulation by chemical modification of enzymes.". Annual Review of Biochemistry. 40: 345–74. doi:10.1146/annurev.bi.40.070171.002021. PMID 4399446. ↑ "Nonspherocytic hemolytic anemia due to hexokinase deficiency". ↑ "Phosphofructokinase Deficiency Glycogen Storage Disease". ↑ Bauer, S; Kemter, K; Bacher, A; Huber, R; Fischer, M; Steinbacher, S (Mar 7, 2003). "Crystal structure of Schizosaccharomyces pombe riboflavin kinase reveals a novel ATP and riboflavin-binding fold.". Journal of Molecular Biology. 326 (5): 1463–73. doi:10.1016/s0022-2836(03)00059-7. PMID 12595258. ↑ Pratt, Donald Voet, Judith G. Voet, Charlotte W. (2008). Fundamentals of biochemistry : life at the molecular level (3rd ed.). Hoboken, NJ: Wiley. ISBN 9780470129302. 1 2 Karthikeyan, S; Zhou, Q; Osterman, AL; Zhang, H (Nov 4, 2003). "Ligand binding-induced conformational changes in riboflavin kinase: structural basis for the ordered mechanism.". Biochemistry. 42 (43): 12532–8. doi:10.1021/bi035450t. PMID 14580199. ↑ Galluccio, M; Brizio, C; Torchetti, EM; Ferranti, P; Gianazza, E; Indiveri, C; Barile, M (Mar 2007). "Over-expression in Escherichia coli, purification and characterization of isoform 2 of human FAD synthetase.". Protein expression and purification. 52 (1): 175–81. doi:10.1016/j.pep.2006.09.002. PMID 17049878. ↑ Zou, YX; Zhang, XH; Su, FY; Liu, X (Oct 2012). "Importance of riboflavin kinase in the pathogenesis of stroke.". CNS neuroscience & therapeutics. 18 (10): 834–40. doi:10.1111/j.1755-5949.2012.00379.x. PMID 22925047. ↑ Brijlal, Sangeetha; Lakshmi, A. V; Bamji, Mahtab S.; Suresh, P. (9 March 2007). "Flavin metabolism during respiratory infection in mice". British Journal of Nutrition. 76 (03): 453. doi:10.1079/BJN19960050. ↑ Aufderklamm, S; Todenhöfer, T; Gakis, G; Kruck, S; Hennenlotter, J; Stenzl, A; Schwentner, C (Mar 2012). 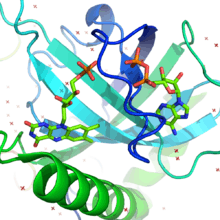 "Thymidine kinase and cancer monitoring.". Cancer Letters. 316 (1): 6–10. doi:10.1016/j.canlet.2011.10.025. PMID 22068047. ↑ Topolcan, Ondrej; Holubec, Lubos (February 2008). "The role of thymidine kinase in cancer diseases". Expert Opinion on Medical Diagnostics. 2 (2): 129–141. doi:10.1517/17530059.2.2.129. ↑ Gotz, A.; Isohanni, P.; Pihko, H.; Paetau, A.; Herva, R.; Saarenpaa-Heikkila, O.; Valanne, L.; Marjavaara, S.; Suomalainen, A. (21 June 2008). "Thymidine kinase 2 defects can cause multi-tissue mtDNA depletion syndrome". Brain. 131 (11): 2841–2850. doi:10.1093/brain/awn236.